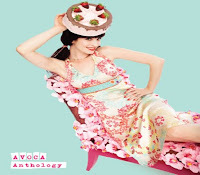 We have just added our gorgeous Avoca Anthology Spring Collection to the website. It is full of girly fun with spots,bows and florals in fantastic spring colours. Check out www.caramelclothing.co.uk for your first feeling of spring! This week is the Five year anniversary of when I started the business. So I have been in reflective mood. I opened a tiny little shop in the front room of a cottage on Honiton High Street. I only had two brands to sell for the first few weeks (Great Plains and Nougat) and nearly sold out in the first week. To keep up with demand I added more brands and after a few months of working 6 days a week with no lunch breaks I was able to take on my first member of staff. I am glad to say that Nikki is still with Caramel today. She now manages the website for me and is one of the ten staff I now have in the two stores. I still remember the customers that I had during those first few weeks and months and I am glad to say that they are still with us as well. So on Thursday 11th we are celebrating with a Shopping evening in both stores. We will provide the bubbly and the fantastic new Spring collection as well as giving 10% off on the evening. We hope you will join us in raising a glass to another five successful years ahead.